I don’t know about you, but I’ve often wondered if the very popular but visually-oriented social media sites like Instagram are a good place to market books (over 300 million visitors a month, more than 70% of them from outside the U.S.). After all, books are words, not pictures (usually). Adrienne Erin knows that authors can get a lot of attention they might not otherwise get for their books with some savvy tactics in hand. Here’s her report. Words are for us as writers what computers are to office workers. They are the lifeline to pretty much every facet of our work. Not only do we use them to communicate our art form, but we obsess, play, hate, love and need them in order to do what we do. Sometimes we need a rest from all the word playing—and hating. Where can we find that rest without cutting ourselves off even further from social exchange, but also without having to use even more words? It can be done—with Instagram. Not only can you use Instagram, but as an author, you should be using Instagram. For more than one or two reasons. There are a lot of authors who use Instagram in ways that may be entertaining. It’s entertaining in the same way the crazy lady in the grocery store is who pulls out every gallon of milk from the dairy cooler in order to get the one that has the furthest date of expiration. Yeah, it’s weird and maybe a little funny, but mostly kind of pathetic. There are plenty of famous authors who evoke that kind of reaction on Instagram. Don’t be one of those authors. Instead, consider some of the following rational ways to use Instagram to help further your author name and influence. This reason really shouldn’t have to be explained. I mean, duh – if you follow enough book-bloggers, you increase the chance that one or more of them will review your book, which is read by said blogger’s audience. Whether that audience is 100 or 100,000 – isn’t it worth it to reach that amount of potential buyers of your book for free? Instagram can be used for promoting your name or your newest book. You can host a contest with a free copy of your book as the prize. You can ask for photo submissions that revolve around the theme of your book or you can just use photos to connect to your fans and readers. As BuzzFeed’s article on book covers altered to include James Franco shows us, humor can be a great marketing strategy. Visual imagery can be the source of inspiration on a daily basis. All you need to do is catalogue it and you have your own visual diary for defeating the worst case of writer’s block. Not only can these photos inspire you, but they may equally inspire your readers and fans, who will in turn, recommend their network to follow you as well. Many writers use inspirational tweets and Facebook posts to reach their readers. Your followers will respond well to inspirational messages that reaffirm their beliefs. This could be a marketing project or it could be research for a new novel. Projects can range from social research to just-for-fun, to things like #100HappyDays, which seems to be a combination of both. 100HappyDays is inspirational, fun, challenging and engaging. Hosting a project like this could provide you with tons of material for your next book, or it could simply attract a ton of followers — aka, readers. What better place to advertise your stunning new book cover than Instagram? Book covers are certainly one of the most powerful tools you have in your arsenal for attracting a new reader. I don’t know about you, but if I come across an author I’ve never heard of, but they write in a genre I like to read and they have a fantastically interesting book cover – I am much more likely to purchase that book. By the way, this is also another reason to never cut any corners on your cover art. You don’t have to reveal all the skeletons in your closet, but a few pictures of your most recent vacation, your adorable pets, a weekend trip to the harbor and a ride on a boat will get you noticed — people love this kind of stuff. The more you draw in your readers and fans by showing that you’re just like them, the more they will be inclined to follow you and interact with your more professional work. Especially if you are a new author, following more experienced authors certainly can’t hurt. Even the most experienced author is not exempt from gaining insight from other authors. Networking with other authors as a new or previously unpublished author can be eye-opening and present you with opportunities you may not have otherwise come across. Instagram is one of the best social apps you can use as an author, because not only does it give us a rest from all those words, but it can be used in so many ways—personally or professionally. You just have start thinking less in words and more in pictures. How have you used Instagram? Let me know in the comments. Adrienne Erin is a writer and freelance designer who blogs at Design Roast. When she’s not writing, she loves to cook, read, and daydream about her next roadtrip. To see more of her work or get in touch, follow @adrienneerin on Twitter. 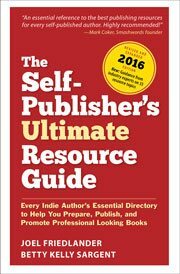 Need to find editors, designers, or others to help you get your book produced, published, and promoted with professional results? Grab a copy of my new book, it has over 850 curated and verified links to the people and companies you’re looking for. This book will save you hours of looking and lots of frustration with its 33 easy-to-follow categories. Buy it now and earn a $15 coupon to use for pre-designed book templates and author tools at BookDesignTemplates. Details are here: Special $15 Coupon Offer. Thanks for the article. I am ready to start marketing my book on Instagram but can’t decide whether I should use my name or the book title as the account name that the public sees. I am also an artist and use my name for my paintings, but my author’s name includes my middle inititlal. I don’t want to start out on the wrong foot! Good article. Just saved me a ton of research time. Thank you, Adrienne. Very inspiring article!! Well done. I started really using Instagram in the past couple of months and I LOVE it! It provides me with the opportunity to express myself in different ways, connect with all kinds of people, and it’s fun. It’s actually my preferred social network. Stop by on Instagram and say hi! http://www.instagram.com/piperpunches. I have also shared bits and pieces of my WIP on IG. Every little thing helps. What if you don’t use a phone to work with photos? Hi Elaine — good question! Instagram was created as a mobile-first application — for the longest time, you couldn’t even get to any Instagram photos from their desktop website! If you don’t want to do your editing on your phone, that’s fine — you can edit images on your computer (the minimum pixel size you need is 640×640, but anything larger at a 1:1 aspect ratio is fine!) and then transfer to your phone to upload using the Instagram app. The easiest way to move it from your desktop to your phone is to email yourself the image. If you don’t have a phone, there are some complicated workarounds (http://www.makeuseof.com/tag/create-instagram-account-upload-photos-without-mobile-device/) but really, it’s easiest if you have a smartphone. That is true — the “follow for follow” community is about as prevalent on Instagram right now as it was on Twitter about 2-3 years ago. The best thing you can do is not get caught up in it, keep sharing great imagery, and assume that people are following because they like your stuff. On the bright side, engagement on Instagram is super easy — double tap! Reading this was a great way to start off my morning. You have my interest. I like the idea of social interaction without the endless (and shameless) self-promotion. People are people, even if they are relentless over-achievers, and that is one hard-wired reality that will never change. Thank you, Michael, I’m so glad you enjoyed my article! I definitely agree! I started using Instagram when I signed up for #100happydays. I’m a painter and a writer, so I use it to show behind-the-scenes painting stuff, I’ll often take photos when I’m journal writing, and I’ll often post photos of tea / coffee. Whenever I go hiking or to the beach I’ll usually put a photo up as well. Uh, that sounds weird when I write it down lol. I think it’s stuff that reflects who I am as a person, and as an author – a creative, artistic, slightly hippy tea-lover. Hi Z.R., thanks for commenting and sharing your Instagram! I always appreciate a good coffee photo 😉 love the WIP painting shots! #100HappyDays is such an awesome project, and I’m glad it introduced you to Instagram! Definitely a great tool for self-expression and connecting with your fans. I write young adult fiction, and I’m told that the social networks to find young adults are Tumblr and Instagram. I did a book signing last month where a couple of the teens I talked to informed me that they were not on Facebook or Twitter, but were on Instagram. So, I have set up an Instagram account! I work with children, from about 8 years up to mid-teens, and I second that – Tumblr and Instagram are the place to be! Wattpad is worth looking into as well, if you haven’t already. That’s great that you’re following your audience to where they’re hanging out! It’s definitely a good place to be for YA! Not to jump in with my own things here but these might be helpful. I’m always happy to add new people and it can be a great place for authors to start. What great lists! They’re a nice place to start when looking for inspiration, and it’s always great to support other authors. Thanks for sharing, Kate! Thanks for letting me share Adrienne! I know when starting out on a new platform it can be tough so I wanted to make something that could help. I have a question, do you suggest to create an instagram account with the book title? or should I just use my account. This is, of course, entirely up to you, but if it were me I would either use just my own personal account, OR create a second, “professional” account to use to connect with my readers. If you are okay with using your existing, personal Instagram as your public persona, I would just use that, because it’s easiest to maintain one account instead of two! I decided this year to make Instagram a promotion-free zone. I’m just so tired of seeing promotion EVERYWHERE that I decided to give it a rest in at least one social media channel. Last year, I participated in a 365 daily photo project and it was great for me and my supply of photos that I could use on my blog. I keep things mostly personal (like your #6 above) but I talk about books or writing life when I have the chance. Last year I tried to post teasers and book covers, but I gathered people just wanted more personal things. Anyway, the daily photos continue this year! I’m looking forward to it. Thanks for sharing your perspective, Stephanie! With all the promotions you’re probably doing elsewhere, it’s a good point that you should have a space that’s purely for self-expression. It’s super nice to have a place that’s just for fun 🙂 Goodness knows I don’t need to promote 24/7 everywhere. How boring! Lol.